Palestinian Authority President Mahmoud Abbas has insisted his aim is to establish a Palestinian state only alongside Israel's pre-1967 boundaries with the West Bank and Gaza. Israel recently accused him of seeking to supplant its sovereign territory. But Mr Abbas, who was born in the town of Safed, told Israeli TV he accepted it was now part of Israel and that he would have no right to residency there. Palestinians have historically demanded the right of return for refugees. Hundreds of thousands fled or were displaced from their homes in the course of Israel's war of independence in 1948-49 and during the 1967 Middle East war. Today, they and their descendants live mainly in the West Bank, Gaza Strip, Jordan, Syria and Lebanon. Some five million are registered as refugees with the United Nations Relief and Works Agency (Unrwa). Israel argues that all refugees should relinquish any aspirations to return to what is now its territory, and instead be absorbed by Arab host countries or by a future Palestinian state, as Israel did with large numbers of Jews who were expelled or fled from Arab lands after 1948. Israel's original boundaries were established after it fought a war of independence with its Arab neighbours in 1948-9. Israel ended the war with much more territory than the UN resolution of 1947, which endorsed the creation of a Jewish state, originally intended. The amount of land under Israeli control increased again after further fighting in 1967 in which Israel occupied - among other territories - the eastern part of the city of Jerusalem, the West Bank of the River Jordan, and the Gaza Strip. For many Palestinians the right to return to lost lands is a deeply cherished dream - many have been living in refugee camps in neighbouring Arab states since the 1940s. In his Israeli TV interview Mahmoud Abbas was re-stating the long-established position of the Palestinian Authority - that it seeks to create a state for the Palestinian people based on the frontiers as they were before the fighting in 1967. In the middle of a parliamentary election campaign in Israel, at a time when there is no meaningful political contact between Israel and the Palestinians, Mr Abbas is signalling to the Israeli public that he wants to be seen as a partner for peace. That implies an acceptance of the territorial gains that Israel made in 1948-9 - a hugely painful and controversial concession in the eyes of many Arabs. As the Israeli TV interviewer points out it also means that Mr Abbas accepts that his own home town of Safed (Tzfat in Hebrew) will be a permanent part of Israel. 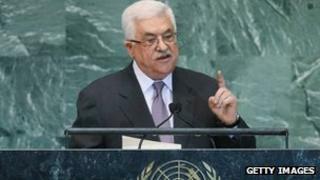 Mr Abbas responds that he feels he has the right to visit, but not to live there. His views were immediately denounced by the more militant Palestinian organisation Hamas which controls the Gaza Strip - it doesn't accept Israel's right to exist and insists on the full right of return of all refugees dating back to the 1940s. The affair illustrates a deep division within Palestinian society and also encapsulates Mr Abbas' own dilemma - he cannot reach out to Israel without alienating at least some of his own people. During his interview with Israel's Channel 2 TV on Thursday, Mr Abbas addressed accusations by the Israeli government that he did not want a two-state solution, but rather sought a state covering Israel, the West Bank and Gaza. Earlier this month, Israeli media reported that the Palestinian leader had written on Facebook that his plan to seek non-member observer state status at the UN would "prove that we are right that our land is occupied and not disputed [territory], and this applies to all the territories that Israel occupied before June 1967". Palestinian officials were later reported to have explained that the West Bank and Gaza Strip were usually known collectively as "1948 Palestine", and that the president was therefore talking solely about land occupied in 1967. An earlier posting on Mr Abbas's Facebook page about the UN membership plan referred to "territories that Israel occupied in June 1967". In the Thursday's interview, Mr Abbas said that although he was a refugee from Safed, he did not intend to return to the city as a resident. "But I want to see Safed. It is my right to see it but not to live there," he said. "Palestine for me is the 1967 borders with East Jerusalem as the capital. This is Palestine," he added. "I am a refugee. I live in Ramallah. The West Bank and Gaza is Palestine. Everything else is Israel." A spokesman for the Islamist movement, Hamas, which governs the Gaza Strip, said the president had only been speaking for himself. "Abbas's statements where he considered that Palestine is just the territories occupied in 1967 are unpatriotic and mean cancellation of the 'right of return'," Sami Abu Zuhri said. "These statements reflect Abbas's culture and will never reflect the stand of the Palestinian nation which is on all of his Palestinian land." Mr Abbas also said in his TV interview that as long as he remained in office, "there will be no armed, third intifada". There have been two Palestinian intifadas, or uprisings, against Israeli rule in recent decades - the first which began in 1987 and the second in 2000.